This is a comprehensive review of commutative algebra, from localization and primary decomposition through dimension theory, homological methods, free resolutions and duality, emphasizing the origins of the ideas and their connections with other parts of mathematics. The book gives a concise treatment of Grobner basis theory and the constructive methods in commutative algebra and algebraic geometry that flow from it. Many exercises included. Illustrations note XVI, 800 p.
Commutative Algebra is best understood with knowledge of the geometric ideas that have played a great role in its formation, in short, with a view towards algebraic geometry. 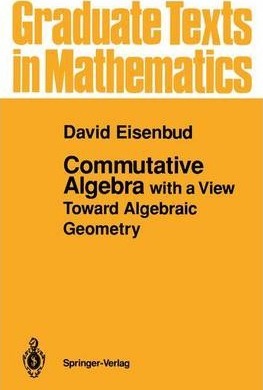 This book will appeal to readers from beginners to advanced students of commutative algebra or algebraic geometry. To help beginners, the essential ideals from algebraic geometry are treated from scratch. Appendices on homological algebra, multilinear algebra and several other useful topics help to make the book relatively self- contained. Novel results and presentations are scattered throughout the text.